A nymph (Greek: νύμφη, nýmphē [nýmpʰɛː]) in Greek mythology and in Latin mythology is a minor female nature deity typically associated with a particular location or landform. 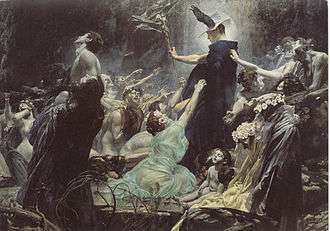 Different from other goddesses, nymphs are generally regarded as divine spirits who animate nature, and are usually depicted as beautiful, young nubile maidens who love to dance and sing; their amorous freedom sets them apart from the restricted and chaste wives and daughters of the Greek polis. They are beloved by many and dwell in mountainous regions and forests by lakes and streams. Although they would never die of old age nor illness, and could give birth to fully immortal children if mated to a god, they themselves were not necessarily immortal, and could be beholden to death in various forms. 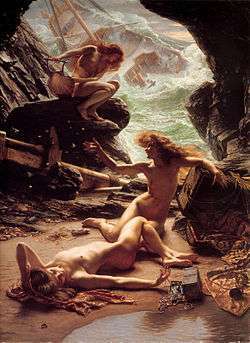 Charybdis and Scylla were once nymphs. Other nymphs, always in the shape of young maidens, were part of the retinue of a god, such as Dionysus, Hermes, or Pan, or a goddess, generally the huntress Artemis. Nymphs were the frequent target of satyrs. 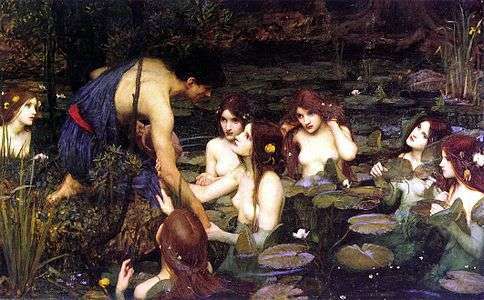 The ancient Greek belief in nymphs survived in many parts of the country into the early years of the twentieth century, when they were usually known as "nereids". At that time, John Cuthbert Lawson wrote: "...there is probably no nook or hamlet in all Greece where the womenfolk at least do not scrupulously take precautions against the thefts and malice of the nereids, while many a man may still be found to recount in all good faith stories of their beauty, passion and caprice. "Nor is it a matter of faith only; more than once I have been in villages where certain Nereids were known by sight to several persons (so at least they averred); and there was a wonderful agreement among the witnesses in the description of their appearance and dress." Orphne is a representation of the darkness of the river Styx, the river of hatred, but is not to be confused with the goddess Styx-herself, but she is associated with both Styx and Nyx. She is the consort of Acheron, (the god of the river in Hades), and the mother of Ascalaphus, (the orchardist of Hades). Melinoe (μήλινος) Orphic nymph, daughter of Persephone and "Zeus disguised as Pluto". Her name is a possible epithet of Hecate. Echo, an Oread (mountain nymph) watches Narcissus in this 1903 painting by John William Waterhouse. ↑ But see Jennifer Larson, "Handmaidens of Artemis? ", The Classical Journal 92.3 (February 1997), pp. 249–257. ↑ Lawson, John Cuthbert (1910). Modern Greek Folklore and Ancient Greek Religion (1st ed.). Cambridge: Cambridge University Press. p. 131. ↑ "heathen Artemis yielded her functions to her own genitive case transformed into Saint Artemidos", as Terrot Reaveley Glover phrased it in discussing the "practical polytheism in the worship of the saints", in Progress in Religion to the Christian Era 1922:107. ↑ Tomkinson, John L. (2004). Haunted Greece: Nymphs, Vampires and Other Exotika (1st ed.). Athens: Anagnosis. chapter 3. ISBN 960-88087-0-7. ↑ Rose, Herbert Jennings (1959). A Handbook of Greek Mythology (1st ed.). New York: E.P. Dutton & Co. p. 173. ISBN 0-525-47041-7. ↑ "The Nymph of the Spring". National Gallery of Art. Retrieved 23 September 2016. ↑ Stephen John Campbell (2004). The Cabinet of Eros: Renaissance Mythological Painting and the Studiolo of Isabella D'Este. Yale University Press. pp. 95–6. ISBN 0-300-11753-1. ↑ Jay A. Levenson; National Gallery of Art (U.S.) (1991). Circa 1492: Art in the Age of Exploration. Yale University Press. p. 260. ISBN 978-0-300-05167-4. ↑ Leonard Barkan (1999). Unearthing the Past: Archaeology and Aesthetics in the Making of Renaissance Culture. Yale University Press. pp. 237–8. ISBN 978-0-300-08911-0. ↑ Elisabeth B. MacDougall (January 1994). Fountains, Statues, and Flowers: Studies in Italian Gardens of the Sixteenth and Seventeenth Centuries. Dumbarton Oaks. pp. 37–56. ISBN 978-0-88402-216-9. ↑ Kenneth Gross (1992). The Dream of the Moving Statue. Cornell University Press. pp. 170–175. ISBN 0-8014-2702-9. Burkert, Walter (1985). Greek Religion (1st ed.). Cambridge, MA: Harvard University Press. ISBN 0-674-36281-0. Larson, Jennifer Lynn (2001). Greek Nymphs: Myth, Cult, Lore. New York: Oxford University Press. ISBN 0-19-514465-1.